Relatively new to the music industry, The Torn Images immerse themselves in the indie scene and create a name for themselves with their debut release, The Dawning EP. Emerging as California natives, The Torn Images is composed only of Briand Arabaca as the vocalist and guitarist, and Jayson Thompson as the percussionist. Their music may urge listeners to question the possibility of only a duo composing the band, but producer Jonathan O’Brien and engineer and drummer Tyler De Young aided in this process for The Dawning EP. 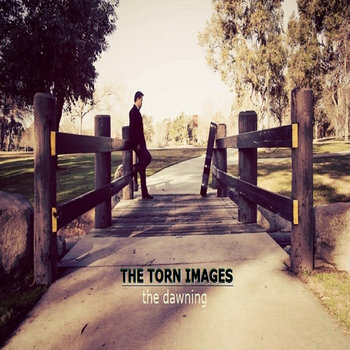 An alternative rock duo with a fresh sound, The Torn Images stand as a band to keep an eye on with their release, The Dawning EP. Opening the EP is the progressive, spacey composition “Scent of Summer” which is also the longest song on the EP. Instantly striking listeners is the ominous nature of the track, particularly haunting the underlying percussion beats and Arabaca’s vocals. Merging alternative influences with electronic influences, The Torn Images initiate their differentiations from other artists. “Scent of Summer” strays from elements generally associated with summer, instead focusing on ambient elements, a consistent combination of eighth and sixteenth note taps on the hi-hat, and echoing, haunting keys. In full control of the tracks’ nature is Arabaca, who consistently delivers vocals that don’t attempt far from his range, except from the higher notes he hits towards the song’s completion. The song embodies what The Torn Images stands for and epitomizes atmospheric rock. However, The Torn Images ensure that they aren’t hiding behind genre restraints. Instead, the band decides upon showcasing their multi-talents through different styles. “Path of Resolution” follows the introductory track, but doesn’t remain consistently with the spacey nature. Though it does include synthesizer aspects, the song has more of a British-rock feel to it. Versus the patterned drumming in the earlier track, “Path of Resolution” highlights Tyler De Young’s percussion abilities. Immediately, De Young's proceeds to set the pace for the song, coming off strong with his driving striking of the snare and eighth note tapping of the hi-hat. The instrumental performance is powerful, but nothing measures up to the vocal performance given by Arabaca. Genuinely hoping for forgiveness, Arabaca delivers the lines, “Oh Heavens, hear my pleas of forgiveness, pour me with the rain of redemption.” The heartfelt vibrancy from Arabaca’s vocals illuminates the emotionally driven song, shining light on the lyrical aspects. Amidst the pleads of redemption and forgiveness, The Torn Images manage to create a serene atmosphere, providing comfort and an outlet for listeners to escape to. Instead of implementing more songs that categorize with progressive elements, The Torn Images attempt to drive forward their British influences again with “Healed Memory.” Beginning with a combined crescendo from Arabaca on guitar and De Young on drums, the energy for “Healed Memory” is immediately set. A mid-tempo rock song, “Healed Memory” doesn’t lack anything concerning a rock-dominated song, fulfilling all the necessary elements of strong drumming, supportive guitar strumming, and a dominating vocal performance. However interesting is that “Healed Memory” features more modern elements, including the synthesizer inclusion towards the song’s midway point. In doing so, the band shows that they can too combine certain rock elements with modern day ones. Having the feel of 80s British rock, both “Healed Memory” and “Path of Resolution” implement rock styles that aren’t found in the majority of modern music. Both songs bring the EP up a notch, showcasing that The Torn Images aren’t just another band, but are a fan that’s paving their way for success. “Heart of Stone” proves to be the EP’s standout track. Unequivocally, the song masterfully creates a vibrant environment, providing boldness and a contagious aspect to it that isn’t found as concentrated in other songs. The standout piece is crafted by the punchy drums and especially signature strong guitar strumming. The combination of both the drums and the guitar provide a strong foundation instrumentally, but without the addition of keyboard, the song wouldn’t form into what it is. The keyboard resides powerfully over the other instruments, truly only competing with the vocals. Fueling the song, the keyboard resonates with contagious melodies, fighting with the guitar for additional dominance. Songs like “Heart of Stone” remind listeners of The Torn Images’ ability to masterfully create modern day pop songs while remaining true to their alternative, progressive roots. Concluding the EP is “Music is My Therapy.” Perhaps the most lyrically significant, “Music is My Therapy” connects with listeners on emotional levels, delving into what listeners potentially perceive music as. Supported by the alternating bass drum kicks and snare hits, “Music is My Therapy” revolves around Arabaca and the sincerity when he delivers connective lines as, “Music is a therapy, an art of beauty to hear and see. Music is my therapy, a major key of remedy.” The darker recording interestingly contrasts with the powerfulness of music. Apart from the lyrical passion, the drums make “Music is My Therapy” the song that it is. There’s a highlighted passion that’s driven within “Music is My Therapy” by drummer that isn’t entirely audible in other tracks. The song centralizes the percussion’s importance, for without it, the track would lack enthusiasm, energy, and as much depth. For an EP release, The Torn Images provide listeners with insight into what the band is made of and the potential the band possesses. Though aspects aren’t entirely perfected, The Torn Images display that they aren’t following restrictions and don’t intend on following one-set path. Rather, the band intends to expand their musical horizons and to explore different materials, while remaining true to their musicality and artistry. An insanely connective, musically unique, and captivating release, The Dawning - EP is a strong, solid foundation for The Torn Images to unleash into the world. At the age of fifteen Alexa Spieler started writing about music and managed to build up her very own music promotional website. Since then she has covered prestigious events ranging from the VANS Warped Tour to Arthur Ashe Kids Day, among more. Music has always been a passion of hers, as well as writing. Putting the two together came the formation of her conducting music reviews. She loves this since she now has the opportunity to find out about new artists, as well as getting to write her own opinion on them. She is always excited to find out about the next ‘big thing’ and as always, to interview them.